Cara-rye malt and Fuggles, a classic hop from the British isles, give this Scottish Ale an underlying spiciness, toffee notes and a unique bready complexity. 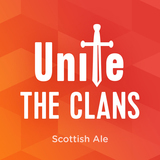 Unite the Clans is a Scottish ale, with slightly roasty and malty flavors and aromas. The addition of cara-rye malt and Fuggles, a classic hop from the British isles, give this beer an underlying spiciness, toffee notes and a unique bready complexity. You’ll want to don your tartan and head to the moors! Unite the Clans won a gold medal at the 2017 Great American Beer Festival in the Rye Beer category!